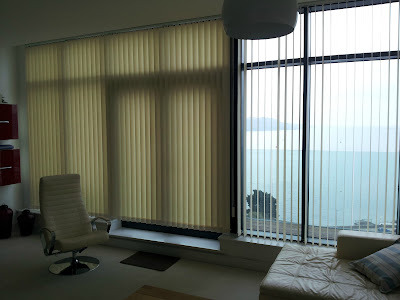 Here is a large set of straight vertical blinds, in this instance the customer first phoned up and asked for roller blinds, though after having a home visit and some free professional advice they choose to go with the vertical blind, in a think fabric that is a dim out, this will help in the shading of their furniture, glare from the Sun, also the fact that you do not need curtains. Curved vertical window blind installed into a curved bay window, these offer superb styling and shading, very simple to operate and keep clean, a great way to enhance your bay window. 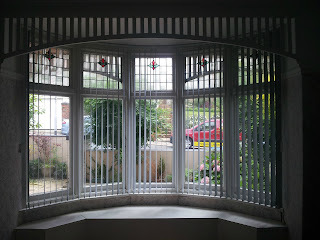 Here the older customer wanted something that would provide both shading and security whilst keeping it easy to operate. They did have curtains but found them increasing difficult to operate, our recommendation was for curved vertical blinds, with a good thick fabric. Again no curtains required. Here are some lounge vertical blinds, its so good too see a lovely room decorated using some great colours, here they have grey vertical blinds, again a very good fabric which help to stop the glare from the Sun, in fact this range of fabrics are machine washable and suitable for any area in the home, in total there are 12 colours to choose from, ranging from white through to grey. Gone are the net curtains that were white or loose colour, in are the vertical blinds that can compliment the décor of you home. 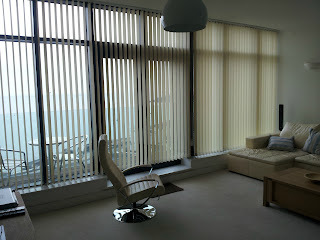 Also vertical blinds will let just if not more light into your room then net colours (fact). As you can see here are some vertical blinds installed into a kitchen, just remember that you need a good quality fabric, something that will be suitable for damp/moist areas, something that is easily cleaned will also help. Here we tried to match the stainless steel finish with a silver effect fabric. Here are matching roller window blinds, these were installed into a kitchen area, both over or covering a patio door and also a kitchen window. This fabric was decided upon to be used to cover the windows due to the lovely bright effect that the has either whilst the blinds are down or up. As you can see the effect looks bright and crisp adding a nice amount of colour and pattern without being too over powering. Bath room roller window blinds, these are ideal for the bathroom, allowing you the amount of privacy that you require. Some customers had stated that they didn't think that they needed a blind for the bath room as the glass was a frosted or patterned glass....Our advice is this, put the light on in the evening then venture outside and have a look into your bathroom, our guess is - you may be slightly embarrassed! These roller blinds are really ideal for most areas though there is not a great deal of flexibility, they are really either up or down. Hence ideal for kitchen window blinds or for bathroom window blinds, though they can be installed into conservatory window blind, in-fact all areas really though this is more dependant on individual taste. 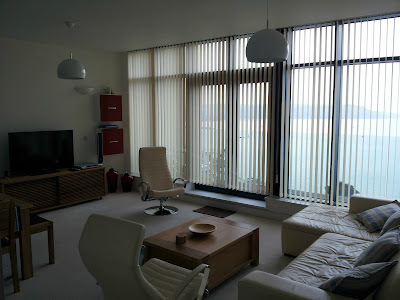 Wood or wooden venetian blinds are a great looking blind, they can compliment most areas of your property, though many companies don't mention, but we always do, they are not really that suitable for kitchens or bathrooms, any where were there are high temperatures or damp and wet areas, this is mainly due to the fact that the slats can warp and get damp. We always warn customers that this may happen, it may not, though as every area in every house is different to the next house, we just like to make customers aware of it. The problem with venetian blinds are that they are an absolute pain to keep clean, we have tried various devices to clean the venetian blinds, but none of the work as good as your good old duster (ideally feather), for occasional dusting and then for a good clean, its got to be good old elbow grease with your fingers and a cloth or damp sponge. Again here are some more wooden venetian blinds, most of the blinds that we install are of the 50mm slat width, though they are available in 25mm, 35mm or 50mm slat sizes. The customer on this occasion wanted some blinds to keep in line with their existing décor, it was a very old building, with period features, we had to oversize the pelmets due to the fact that the walls ran off at an angle, this ensured that the finished effect looked amazing. The wood venetians really complimented the customers furnishings and they could not believe how much different the windows looked. Yet again another 100% happy customer! Opposite we have the metal/aluminium venetian window blind, these can be available in either 25, 35mm or 50mm slat widths. Though not all of the colours and finishes are available in sizes. Here the customer wanted wood effect aluminium venetian window blinds, again there is no real difference to the wood or the ali blinds, the same being they are the same for cleaning! Though in a bathroom or kitchen it is advised to have the aluminium venetian window blinds installed due to warping or dampness getting into wood venetian blinds. Though again this is more down to the customer. In our aluminium venetian window blinds we have around 200 different colours and finishes to choose from, ranging from perforated, plains, metallic, patterned to silver effect. To the left we have the Velux skylight window blind, they are available in either Velux blackout roller blind, Velux normal roller blind, Velux venetian blind, there is also a motor option available along with a manual operating pole if the window is high up. These blinds are great for your loft/attic conversions, though it does seem as though the majority of the ones that we install are the blackout roller option, as this does what it states on the box. All of Velux window blinds we install in Plymouth are genuine Velux blinds, direct from Velux, we can install them free of charge to customers in the Plymouth and surrounding area and they are the same price as if you bought them direct from Velux themselves, though you do save on Postage and Packing when bought through us, so you are in a win win situation. Pleated window blinds are a flexible way of providing your shading and privacy, though normally they are more suited to be installed into conservatories, either being used as roof blinds, side window blinds or for both, they have a silver backing which will direct heat and UV rays away from the inside of your conservatory. In this instance the customer wanted it in a bedroom area. As you can see the fabric colour shown compliments the interior décor. Curved track vertical window blinds for bay windows, in this instance the customer was elderly and could not cope with big heavy curtains for their bay window, installing a curved vertical blind into this bay window has helped this customer in being able to adjust the amount of light and also privacy along with the fact that they are very easy to operate, open and close. The customers family were over the moon with the blinds and they loved the way that the curved vertical blind followed the curve of the bay window, in-fact they we so happy with it, they decided to order another curved vertical blind for the dining room. Vertical window blinds, curved vertical window blinds, roller window blinds, venetian window blinds, wood venetian window blinds, pleated window blinds, Velux skylight window blinds, you name it we can supply and install it. Free home visits. You can rest assured of a quality and professional service from start to finish, with no order too small or large. One call and we do it all, measure, make, supply, install, tidy up, advice.